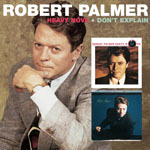 Share the post "Album review: ROBERT PALMER – Heavy Nova,Don’t Explain,Ridin’ High,Honey – Reissues"
Edsel Records have done a neat job with these 2 in 1 packages, brigading together Palmer’s 1988 – 1994 output in slip case outers, extensive artwork and bonus tracks. But never mind the packaging, what about the music? It has to be said, Palmer never really built on his mid-eighties success around the world with the classic Addicted To Love – a single that boasted one of the most iconic music videos ever. Instead, he continued to flit between rock, reggae, and rat pack crooning in a way that wasn’t entirely comfortable for those other than his most ardent of fans. The first album here – 1988′s Heavy Nova – is a classic example, containing the Simply Irresistible single that aped Addicted To Love and the Power Station style of straight ahead rock, married with the bossa nova, South African township roots and even yodelling (a reference to his resettling from Nassau to Switzerland). 1990 saw him release Ridin’ High – his ‘lounge’ album and voted Best Dressed male. It predates Buble and Robbie’s dalliance with the swing / Tin Pan Alley sound and is really only going to appeal to fans of the genre. It was album that, perhaps not unsurprisingly, marginalised his rock fans and signalled a general downturn in his popularity. So, nice packages, and if you’re looking to replace old vinyl, then what are you waiting for? But those unfamiliar with the man’s works would do better to be well advised to listen before they leap. This entry was posted in ALBUM REVIEWS, All Posts, Reissues and tagged Don't Explain, funk, Heavy Nova, Honey, jazz, R&B, reissue, Ridin' High, Robert Palmer, rock, Vinegar Joe. Bookmark the permalink.